BLESSED be Your name forever, O Lord, Who have willed that this temptation and trouble come upon me. I cannot escape it, yet I must fly to You that You may help me and turn it to my good. Now I am troubled, Lord, and my heart is not at rest, for I am greatly afflicted by this present suffering. Beloved Father, what shall I say? I am straitened in harsh ways. Save me from this hour to which, however, I am come that You may be glorified when I am deeply humbled and freed by You. 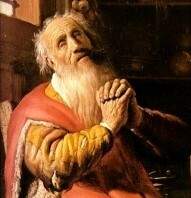 May it please You, then, to deliver me, Lord, for what can I, poor wretch that I am, do or where can I go without You? Give me patience, Lord, even now. Help me, my God, and I will not be afraid however much I may be distressed. But here, in the midst of these troubles, what shall I say? Your will be done, Lord. I have richly deserved to be troubled and distressed. But I must bear it. Would that I could do so patiently, until the storm passes and calm returns! Yet Your almighty hand can take this temptation from me, or lighten its attack so that I do not altogether sink beneath it, as You, my God, my Mercy, have very often done for me before. And the more difficult my plight, the easier for You is this change of the right hand of the Most High.